Serbian armed forces were put on the highest combat readiness after Kosovo’s Special Forces made their way into a Serbian enclave in the self-proclaimed state on Saturday. Some 60 ROSU troops arrived on the territory of a Serbian autonomous region in the northwestern part of the area claimed by Kosovo, in violation of the agreements between Belgrade and Pristina. The Kosovar special forces positioned itself around the dam on Gazivoda Lake and took control of the local hydroelectric power station, detaining several Serbian citizens. They also entered the Center for Ecology and Sport Development in Zubin Potok, Marco Duric, director of the Office for Kosovo and Metohija in the Serbian government, said. The Kosovar troops were sent to the Serb-populated area in order to provide security during a boat trip to northern Kosovo by the self-proclaimed state’s leader, Hashim Thaci. Thaci, who is facing protests in Pristina over the possible land swap with Belgrade, made a visit to Gazivoda on Saturday that was labeled a “PR-stunt” by Boris Malagurski, a film director and political commentator. “The reason why he went there on Saturday was because the movement, called Self-Determination (Vetevendosje), had huge protest in Pristina and he tried to drag away attention from that and show that he is very powerful and can go wherever he wants,” he said. Tens of thousands of people from across Kosovo flocked to Pristina on Saturday to say ‘no’ to the land swap proposed by Thaci. 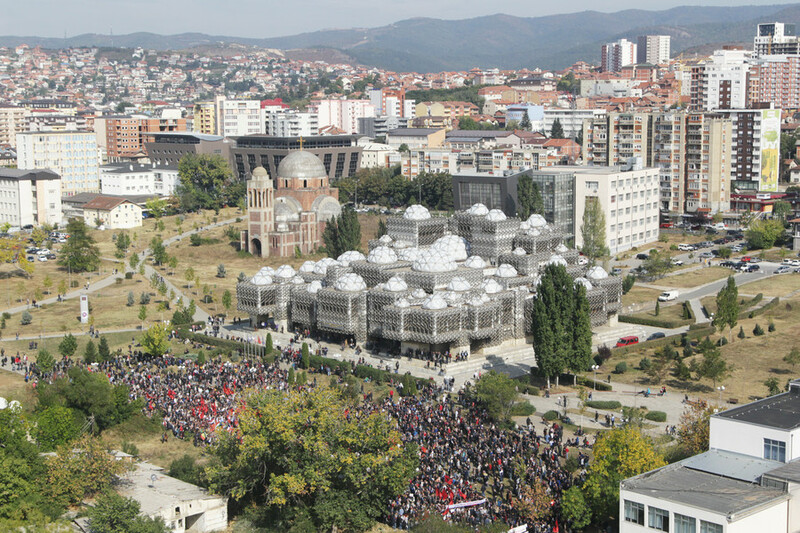 They gathered at the city’s Skanderbeg Square, chanting slogans and carrying Albanian national flags. The leader of the Vetevendosje movement, Albin Kurti, told the crowd that the Kosovars won’t accept “new pain and new compromises” and blamed Thaci for “poverty and corruption,” plaguing the self-proclaimed state, the Balkan Insight reported. The EU insists that Belgrade and Pristina must “normalize relations” if they want to join the bloc, with Thaci earlier saying that “border corrections” could be part of that process. No formalized plan for the swap has been worked out so far, but one of the proposals is to exchange the predominantly ethnic Albanian Presevo Valley in southern Serbia for Kosovo’s north, which is populated by the Serbs. Serbia’s President, Aleksandar Vucic, has ordered the country’s armed forces to be on the highest combat alert in response to the incursion by Kosovo’s special forces, with the measure still being in place. Serbian Interior Minister, Nebojsa Stefanovic, described the incident as an “Albanian attack” in the country’s Kosovo and Metohija. Pristina dismissed the claims of occupying the area and said there were no arrests carried out, according to the local deputy police commander, Besim Hoti. The troops were at Gazivoda for a “single visit,” he told RTS. ROSU servicemen withdrew from the dam at around 16:10 local time (14:10 GMT) as soon as Thaci’s visit concluded, Duric confirmed. The official said the situation was “very dangerous” and compared to state of things to the start of the Arab-Israeli conflict. The ROSU troops “were armed to teeth and looked more like terrorists than security forces,” he added. Malagurski believes that the repeat of such provocative incidents between Kosovo and Serbia is unlikely. “They’ve finished their PR stunt and, I think, this is where it ends,” especially, after Belgrade sent a strong message to Pristina by putting its military on high alert, he explained. The control over the Gazivoda and its facilities has been a matter of dispute between Belgrade and Pristina for years. The lake is the major drinking water supplier for several municipalities of the region and a local power station also uses the water from it. Self-proclaimed Kosovo unilaterally declared independence from Serbia in 2008 and the recognition of the region is matter of a major international dispute. Kosovo has been recognized by the US and a number of its allies, yet, a number of countries, including Spain, China and Russia opposed the controversial move. In fact, over half of the UN states did not support Kosovo’s independence. UN Secretary General Antonio Guterres said on Friday that “Kosovo is not a state” for the international organization.